Not afraid to express yourself? Good, our shirts have attitude and something to say. Make a statement or make 'em laugh with T-shirts from weareright.com. Got a great idea for the next We Are Right T-shirt, send it to us - we won't give you anything for it, but we might use it and will be sure to take all the credit for it. These tee shirts are available in eight different colors and seven (got that, SEVEN) sizes. Yes, we realize that some of you are no longer a fit and trim size 44 chest, so we're offering our awesome shirts in sizes up to triple XL. Choose your color, choose your size, choose your quantity. 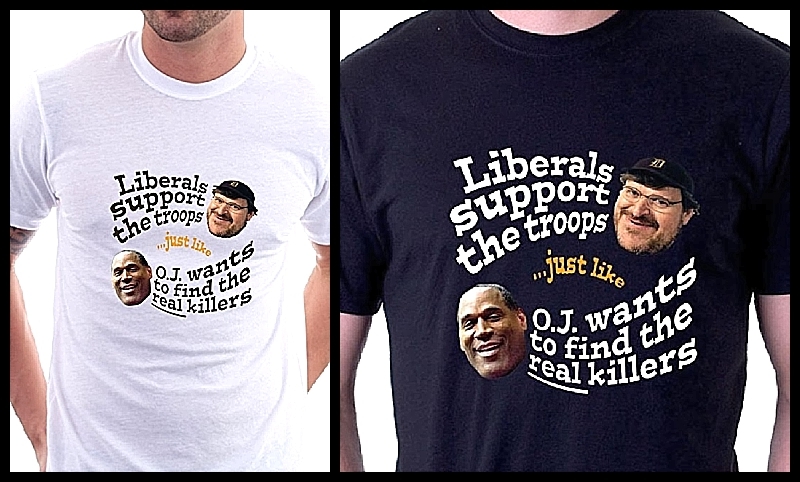 Liberals support the troops just like OJ wants to find the real killers is boldly printed across the front or back of the tee....You can choose at checkout. Our direct to garment printed Republican t-shirts are priced low enough that you could have a fresh one for every day of the every day of the week!